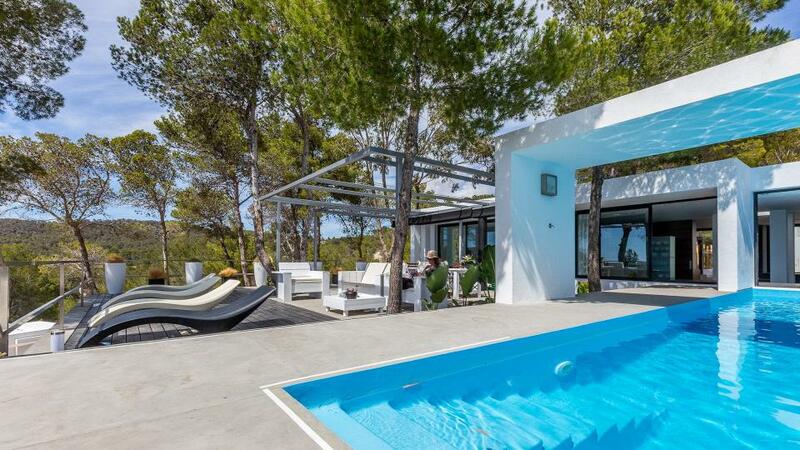 Modern style house, very comfortable and well equipped with a privileged location in the bay of Cala Tarida, just above the beach. Room, Ground level. This bedroom has 2 twin beds configurable as a double bed. Bathroom ensuite, With shower. This bedroom includes also air conditioning. Room, 1st floor. This bedroom has 2 twin beds configurable as a double bed. Bathroom outside the room, private, With shower. Room, 1st floor. This bedroom has 1 double bed. Bathroom outside the room, private, With bathtub. Room, 1st floor, view of the sea. This bedroom has 1 double bed. Bathroom ensuite, With bathtub, shower. Room, Ground level, in another building. This bedroom has 1 double bed. Bathroom ensuite, With shower. Large living room with television, international satellite and stereo. Dining room for 10 people. Both rooms are very bright and offer access to a covered terrace with a lounge and an outdoor dining area, with also access to the pool. Fully equipped kitchen with dishwasher, ceramic hob, oven, microwave, blender, Senseo coffee maker, American fridge and washing machine. Fully glazed living room with armchair. Terrace with deck chairs and sun loungers. All terraces are equipped with quality furniture, Balinese beds, sun loungers, tables and chairs, barbecue (gas). Closed parking for several cars. Just 200 m from the beach, you can easily walk to several restaurants and the center of Cala Tarida where there is a supermarket, pharmacy and shops. 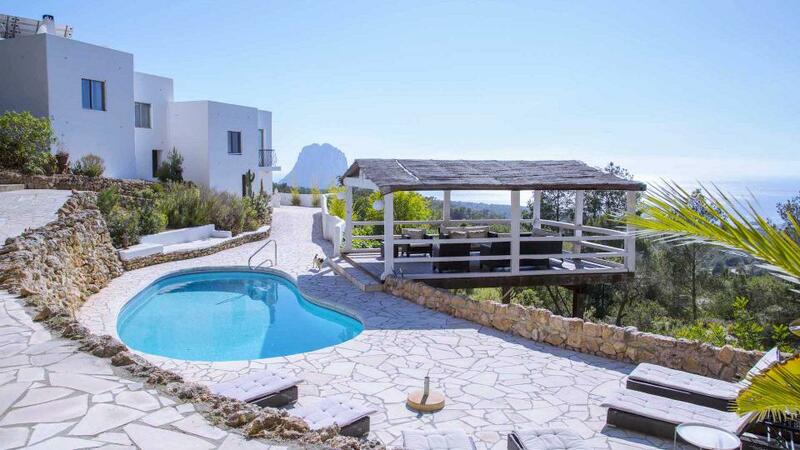 The house is 4 km from the village of San José, 25 km from Ibiza town and 20 km from the airport. The nearest beaches are Cala Tarida, Cala Conta, Cala Bassa, Cala Moli, Cala Vadella and Cala d'Hort. Due to the proximity of the beach and the hotel, the neighborhood is noisy.